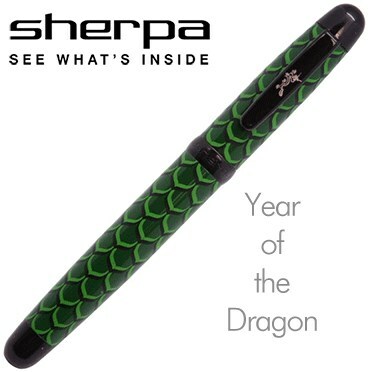 If you're looking to add elegance and style to your Sharpie marker pen, look no further than this limited edition 'Year of the Dragon' Sherpa pen shell. For those who are unaware, the Sherpa is a unique pen shell introduced in 2008 that holds a variety of disposable pens and markers including Sharpie - the magician's staple pen. Each Sherpa is designed with an innovative cap to keep the colour of your marker or pen bold and fresh every time, and this limited edition model is a collector's must-have item. In honour of the 2012 'Year of the Dragon', this one-of-a-kind Sherpa is limited to 888 pieces and is decorated with emerald dragon scales and includes the Chinese symbol for Dragon on the barrel, as well as an etched dragon on the clip. Each pen includes its own unique number etched on the center ring and the box insert is also numbered as well. Your purchase includes the limited edition 2012 'Year of the Dragon' Sherpa pen shell, as well as a standard Sharpie marker pen.